It’s the bottom of the 9th inning, and corporate America is just one out away from another major victory. According to a new study from the International Trade Union Confederation, corporate America has all but destroyed workers’ rights in our country. The study looked at things like workers’ ability to strike or protest, to engage in collective bargaining, and their basic civil liberties. A 97-point evaluation of labor-related criteria by the International Trade Union Confederation found that the United States ranks as bad as Pakistan, Indonesia, and Thailand when it comes to workers’ rights. Of course this shouldn’t come as a surprise. Over the last three years alone, more than a dozen corporate-friendly Republican-controlled states have put limits on collective bargaining for public employees, and 19 other states have pushed for right-to-work-for-less laws that destroy private unions. But the U.S. didn’t always used to be at the bottom of the barrel when it comes to workers’ rights. For nearly a century, it was unions and strong workers’ rights that made us proud to call America home. And it was thanks to unions that America had a strong and robust middle class. But, over the last three decades or so, corporate America and the wealthy elite have been waging an all-out war on workers, and on the very unions that helped build our country. As result, ever since Reagan came to Washington, corporate profits have been on the rise. 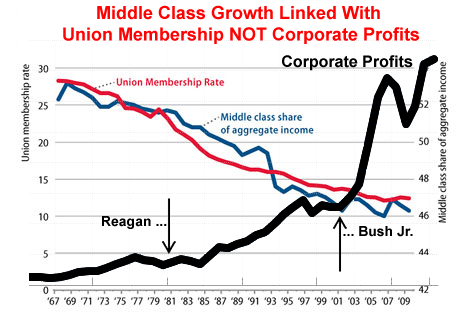 But as corporate profits have been rising, America’s union membership rate has been in a freefall. And a study by Tali Kristal, a sociologist at the University of Haifa in Israel, found that the relationship between rising corporate profits and falling union membership is undeniable. But corporate America’s war on workers’ rights isn’t just hurting unions and the labor movement. It’s hurting the American middle-class too. As the group Unions Work has pointed out, while union membership has been declining steadily since the late 1960’s, middle class income has also been shrinking. Similarly, a study by the Economic Policy Institute found that the drop in union membership that America has seen over the past three decades has contributed to our country’s income inequality epidemic. So, not only is corporate America trying to score a knock-out blow against workers’ rights, it’s also systematically destroying the American middle class, while making the rich richer. But what corporate America and its Republican allies in Washington fail to understand is that America’s economy is strongest when the middle-class is thriving. And the American middle class only thrives when there are strong workers’ rights and when union membership is high. It’s not just a freak coincidence that in the 1940’s and 1950’s when union density was at its highest, income inequality was at record lows. Fortunately, all across our country, working-class Americans are fighting back, and standing up for workers’ rights. From the Fight for 15 to the fast food strikes across the nation, Americans are saying enough is enough, and are fighting to bring back the unions and robust middle class that once made our nation great. So, while we may be in the bottom of the 9th inning, and corporate America may have our backs up against a wall, there’s still time for us to come back and win this thing. It’s time to restore the labor rights that we’ve lost, repeal Taft-Hartley, stop the insanity of Right To Work For Less, rebuild the American middle class, and make our nation great again. You and I have the power to end Nixon’s failed War on Drugs once-and-for-all. In fact, it’s our constitutional right to do so.